If you are in a hurry to reach the wild Highlands of Scotland, do not bother landing in Glasgow or Edinburgh. It will take you ages to clear out customs, get you luggage and eventually find a car, and then battle with the traffic, especially in Glasgow! To avoid all this, fly directly to the small regional airport of Inverness (BMI or Easyjet). You’ll see the luggage being unloaded directly in front of you and minutes later you can be in your car driving off. If you are in a real rush, Ord distillery or Tomatin are only 20 minutes drive away… if you are a little more patient, Craigellachie is one hour down the A9, and if you are looking for Highland tranquillity, a place where the mountains meat the sea, drive West, one hour, and you’ll reach Ullapool. Ullapool is a true fishing village, with a great Harbour road and their pubs, some local ferry services with the only connection to Stornoway in the outer Hebrides. 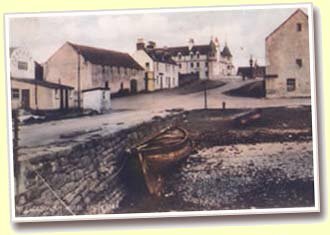 There are a few restaurants there (The Ceilidh Place would come on top of my list), but if you are looking for a simple bar/restaurant with great local atmosphere, good malts and interesting pub (sea)food, go to the Seaforth, just opposite the harbour. As the road climbs the mountain range separating the west to the east, the scenery changes from luscious and green, to deserted and wild. If you are lucky, you will see more dears than cars. If you arrive by night at Ullapool, you will see the lights of the harbour in the distance, and you can ignite appetite for some seafood or fish & chips, because this is what you will get at the Seaforth. That evening we arrived at around 6PM in Ullapool, the sky was almost dark and the bar started to fill up with locals, all drinking beer and whisky and watching Scotland getting smashed by the Italians in rugby. Thank god it wasn’t France, because the ‘ambiance’ was warm! I spotted a full bottle of Ardbeg 1978/2005 (43%, G&M). Quite pricey at £8 a dram, but that’s Ardbeg now! The claws were delicious, meaty and nicely spicy, served with chips that only the Scotts know how to do. The Ardbeg was classic, exactly what I expected: a gentle smoky/peaty nose, not really organic or farmy, but more like a slow roaring coal fire. The match with the crab was perfect. The mouth showed more power than I expected for only 43%. Deliciously round, good length and above all highly pleasurable and drinkable.